In the most recent issue of the FITDIVER® newsletter I shared a winter squash recipe for Spaghetti Squash. 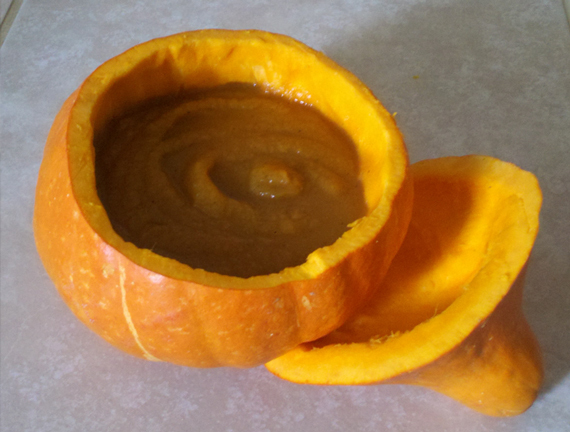 Here is another winter squash recipe for you. This beautiful Red Kuri Squash makes a nice soup turreen for my pumpkin and red kuri squash soup. Cut each squash in half and remove seeds. Lay squash halves flat side down in 1/2 inch of water on an oven sheet or microwave safe cooking tray. Bake at 425 degrees in the oven for about 30 minutes. Only takes 15 minutes on high in the microwave. Clean squash from the skin with a spoon and discard the skin. Place the squash in a blender, add 8 to 12 ounces of vegetable juice and 1 cup of water OR 2 cups of vegetable broth. Season with 1/2 teaspoon each of black pepper, salt, nutmeg and allspice. Blend until soup consistency. This is a savory soup and is very good cold or hot, but not in between.